Here's what was on tonights dinner menu. 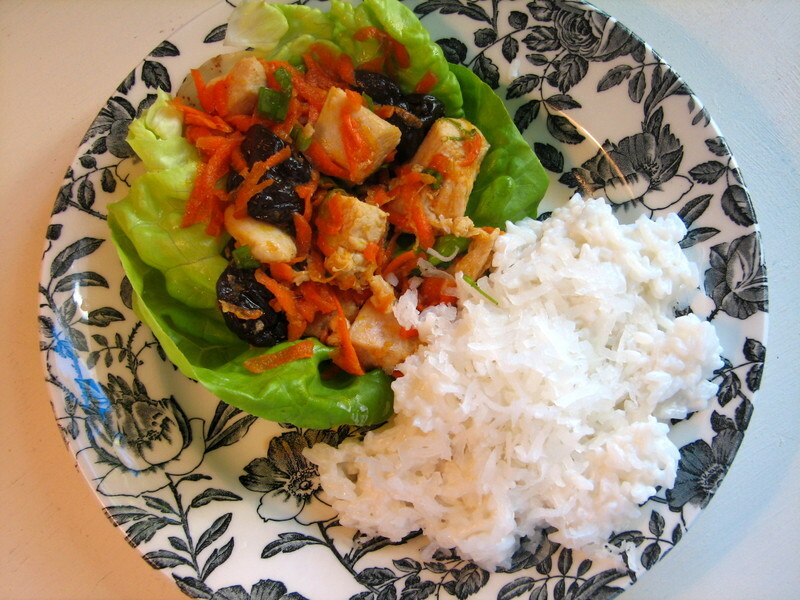 Cherry Chicken Lettuce Wraps & Coconut Rice. This recipe will serve 2 if you are making it as a main course, or 4 for an appetizer. I can't remember where I found these recipes (I think allrecipes?) but they are super simple and easy on the eyes (ha ha ha). The meal was ready in about 45 minutes. I prefer to use "Butter Lettuce" when making wraps because they have a great natural curl to them. Also, the recipe calls for fresh cherries, which the local grocery store had but they were over $4 a lb-- eekk, so I whipped out my handy dandy dried ranier cherries from Trader Joes and they worked great! Enjoy! In a saucepan, combine coconut milk, water, sugar and salt. Stir until sugar is dissolved. Stir in Rice. Bring to a boil over medium heat. Cover, reduce heat and simmer 18-20 minutes. Serve with sprinkled coconut on top.